Cassia has been working in the Outer Provinces, looking for any sign of Ky, held together by the hope of the poetry that her grandfather gave her and her memories of the boy she loves. After months, she finally picks up his trail, and learns that he has escaped with two other boys to the Carving, vast canyons on the edge of the Society's control. She escapes with her new friend Indie and the two girls follow Ky. But their reunion isn't all that Cassia expects it to be. There are secrets that Ky has kept from her, and they might force them apart once more. Will their love and will to survive be enough to keep them together? 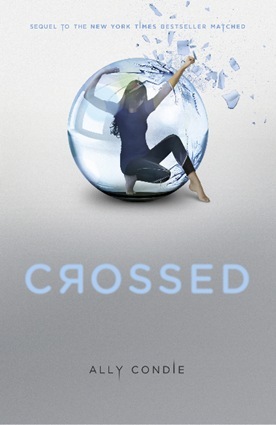 Crossed is a much more philosophical and thoughtful book than its prequel, Matched. In between rich, metaphorical language, Condie has woven in two beautiful poems by Dylan Thomas and Alfred Tennyson that don't just accentuate the novel, but become integral elements as Cassia realizes that the poems aren't just illegal, but an vital part of the rebellion. Condie also does a beautiful job with the character development as Cassia has to re-evaluate all of her beliefs and Ky grapples with the idea of the rebellion and how it plays into his relationship with Cassia. In addition, the new supporting characters are interesting and complicated and each experiences their own inner turmoil. This drama all plays out with a fair amount of action in the rugged, beautiful, and fascinating canyons, a wonderful setting. At the end, there is a twist that readers won't see coming, and though it may be hard to accept at first, it's a tantalizing new development that has the potential to alter the dynamics between the characters dramatically. Crossed is a thoughtful, very readable book, and though its ending is a bit abrupt, it sets the stage for what's bound to be a very good sequel. Cover Comments: Love this cover! It's very representative of how Cassia really has to re-arrange her thinking and break out of the bubble. Awesome. This book is out today! Great review-- I'm looking forward to seeing how Condie develops her characters.